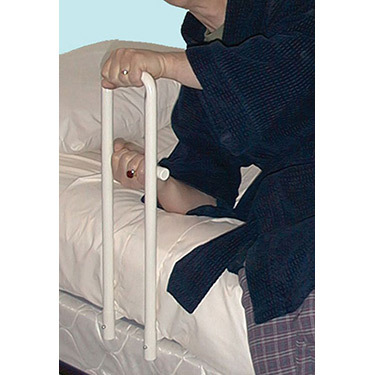 The Transfer Handle Bed Rail eases home bed transfers, helps prevent falls and injuries, improves in-bed mobility and assists with standing and balancing. Steel handle mounts to 30in.W x 27in.L bedboard (included), which supports the sleeping area and mattress edge. 4in. internal width of the handle helps prevent entrapment. Handle height is 22". Rail weighs 17 lbs. Weight capacity 250 lbs. Fits any size or style home bed. Installs easily; no tools required. This rail can be used on Twin, Full, Queen and King size beds. Internal width of the handle: 4". External width 5.5"
We ordered a second one. One is installed at the head of the bed and one at the foot. This slides under the mattress. So users need to consider that before ordering. Pros:Very large mounting board makes installation very secure. Easy to install. Fast delivery. Cons:No height adjustment. Very minor issue. My wife has ALS and at this stage needs help pulling herself in and out of bed. The transfer rail works great and was easy to install. Pros:Strong support for lifting.. Works well. Easy to install. Very useful and sturdy bed rail. I bought this for my mother who was having trouble getting out of bed. It has definitely helped. She likes the smaller size, not too wide. I like how you can remove the handle without taking out the stabilizing board from under the mattress. Pros:Sturdy, easy to use, compact. Very helpful for my Mom to get out of bed. My Mom said the bed rail is very helpful. Pros:Sturdy. Helps my Mom pull herself up to get out of bed.